Bar stool with arms. 4 leg high resistant steel rod base. Base finished in polished chrome. 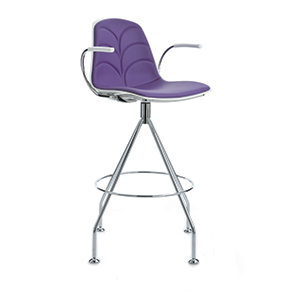 Arms chromed steel with polypropylene armrest cover in matching color. Shell in polypropylene with polished back and embossed anti-slip treatment on front. Swivel. Optional partial upholstery of front of shell, or optional complete upholstery of shell. Various upholstery patterns including flat (standard), fountain, channel, droplet or dots. Optional outdoor treatment available. Minimum order of 4. Partial fountain upholstery pattern + $39. Total fountain upholstery + $44. Partial channel upholstered +$74. Total channel upholstery +$78. Partial drops upholstered +$74. Total drops upholstered +$80. Partial dotted upholstered +$373. Total drops upholstered +$385. Outdoor treatment (Minimum quantity of 30) - $80. Water drain hole - $34. Matching arm upholstery - $80.